Barco S3 4K Screen Management Controller | On Event Production Co. The Barco S3 is a very comprehensive screen management controller. Capable of seamless switching with multi in / out setups, multilayer, edge blends, active comfort monitor systems and more. The Barco S3-4K is ideal for high-end events because it is so flexible and can be tailored to the needs of each event perfectly. Our Barco S3 rack comprises of the Barco S3-4K Junior with an additional input card providing a total of 12 inputs. The 12 inputs are made up of 4x SDI / 4x Display Port / 4x HDMI. We provide adapters to have the display port inputs as either HDMI or USB-C giving you plenty of options suiting many events. We also supply our Barco S3 rack complete with a control laptop to run the Barco control software for you to setup your system and create pre-sets for switching and run them during your events. The Barco S3 switcher can do a multitude of resolutions up to 4K. It has a customisable Multiview Output which is sent to a 17” Black Magic Design screen showing whatever you set it up too, usually this will be all the inputs available and all the program outputs you have running. The rack includes a custom panel matching the design on all our other video racks. 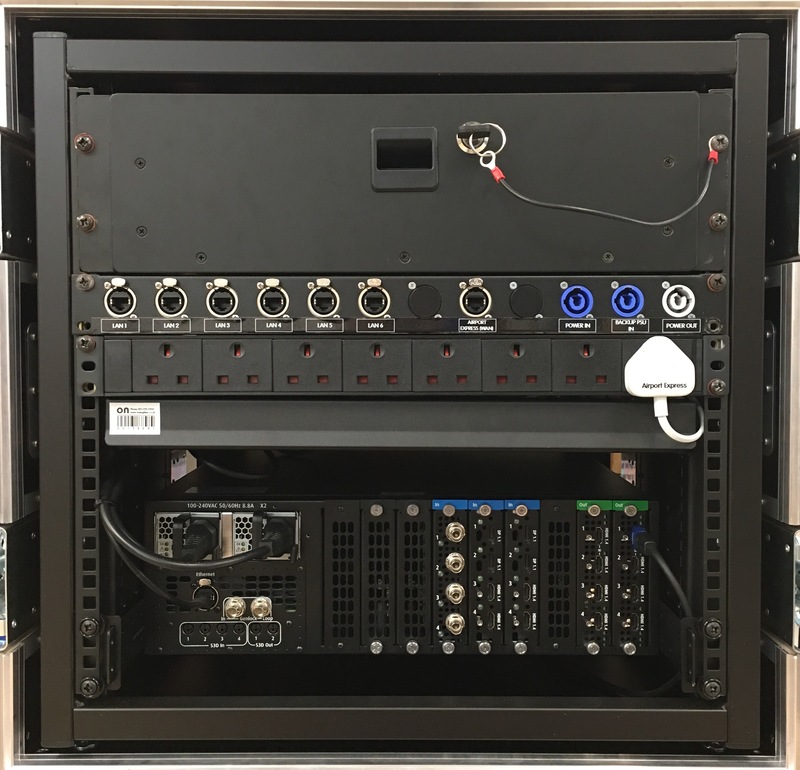 It allows for power in and out of the rack including the redundant PSU in the S3, and data from the built-in switch inside. You are also able to network all your laptops in video control together to easily transfer files and connect to the internet through the WAN socket on the rack.